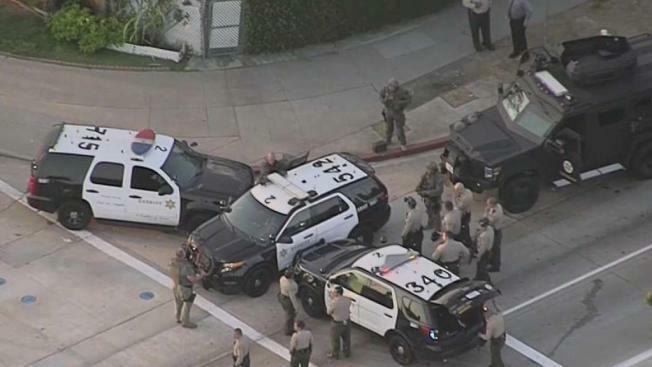 A man barricaded himself inside a Los Angeles County Sheriff's Department sports utility vehicle early Tuesday at a Montebello intersection. The standoff began at Garfield Avenue and Northside Drive after deputies conducted a traffic stop. A man was handcuffed during the stop and placed in the back of a patrol SUV. He somehow slipped out of the handcuffs and refused to come out of the vehicle, according to the sheriff's department. It was not immediately clear why the man, possibly armed with a knife, refused to get out of the SUV. He surrendered to deputies around 7 a.m. Nearby were closed. No injuries were reported.